So you want a plug-in electric but don't feel like waiting to buy a Chevy Volt or a Tesla Roadster? Do you also only need to hit 40 MPH on a straightaway and said straightaway is only 40 miles long? 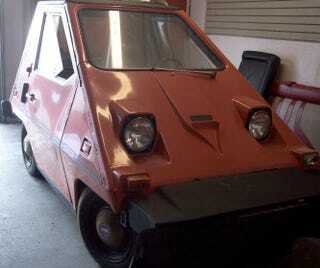 Then maybe you need to get yourself a 110V plug-in 1979 Sebring-Vanguard electric CitiCar. Oh, you can't find one of the 2,200 little 3.5 HP two-seaters powered by eight 6V golf-cart batteries made by the Sebring-Vanguard car company from the Florida city of the same name? No worries, there's one up on EBay and you've got about two hours left before the gavel drops. The current bid's just $1,550. Wait, you want to know more? Hit the jump — we'll pass for now, we're waiting for a second one for the other foot. Available for auction is an electric comuta-car. This is an all electric car built in Sebring Florida in the 70's as a fight against high fuel costs and to be pollution free. You would plug it into a 110 V outlet to charge the batteries, and experience up to 40 miles of inexpensive driving at speeds up to 40 m.p.h. It is made of all aluminum and cycolac body. The advertising says that all of the components, such as, differential,brakes wheels, tires, and electrical systems have been engineered, tested and developed for specific application in an electric car. It has been made with a full roll cage crafted of aircraft aluminum to offer protection. Extra high back seats and belts are added for safety. This car was originally sold for $4,495.00 new. I do have have a few a couple pages of advertisement price sheet and a service manual. This electric car has been sitting for years. It does not run. This is a complete car with side doors and door handles. I am not positive that this is a 1979 car as I am still looking for the title. The storage of the batteries are concealed in the bumpers. It has 763 mi. on the odometer. It is an orange car. The body has a couple minor cracks. One on the drivers door and one on the A-pillar. It has an Illinois tag on it from 1982-83, being the last time it was ran. The interior is very nice. No wear or tares. It needs cleaned up and a new set of batteries. This car is sold as is, no warranty intended or implied. I am also taking offers on the car locally so I reserve the right to pull the car from the auction at anytime. It will need to be trailered at time of pick up. There is a reasonably low reserve on the car..